This blog has been written by Jamie Thompson, a PhD student who works with Professor Morgan Alexander in the Biomaterials Discovery Group. After selling out all events last year, Pint of Science returns to Nottingham for its 3rd year running. As part of the three-day Pint of Science festival, thousands of scientists around the world will speak about their research. The festival brings a unique line-up of talks, demonstrations and live experiments to the nation’s favourite locals. 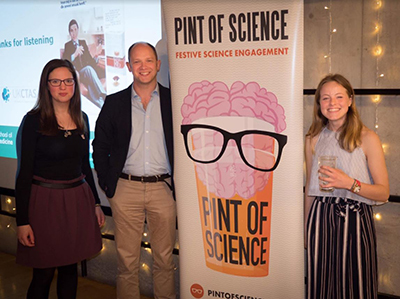 Hannah Tomlin and I, both second year PhD students, joined the Pint of Science team last year and were involved with publicising the festival. 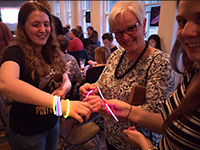 This year, we have taken on the role of co-ordinators, managing a team of over 60 volunteers! As the festival is gaining popularity, we thought we would host 7 different science themes in Nottingham this year: Planet Earth, Tech Me Out, Our Society, Our Body, Atoms to Galaxies, Beautiful Mind and a new special theme focused around the science of Nottingham, Nottingham Frontiers. We are also hosting a sub-theme of the festival, with help from Shalaka Kurup and Nicole Zordan, called Creative Reactions. This is a programme where artists and scientists collaborate to produce incredible artworks inspired by scientists’ research, such as poetry centred on quantum physics, improvised comedy based on scientists’ short monologues, temporary tattoos inspired by sustainability and much more. These works break down barriers between the two subjects and encourage creativity for both parties. The results are breath-taking! 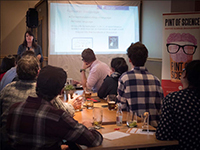 We think Pint of Science is a brilliant way to communicate real research and encourage non-scientists to feel more comfortable understanding and discussing complex scientific concepts. This also helps people distinguish science fact from science fiction with stories they hear in the media. The festival makes science informal and helps demonstrate research impact. It’s a brilliant way to stimulate interest and better understanding of science in a relaxed and approachable atmosphere. Tickets are available from the Pint of Science website, with each evening costing just £4! Imperial College London awarded Pint of Science the “President’s Inspirational Partner Award for Excellence in Societal Engagement” in June 2017 and Pint of Science was awarded Points of Light by the UK Prime Minister in November 2015.